I cooked with my solar oven every sunny day for one year, and still continue to use it. Solar cooking is easy, fun and economical, it also makes some very tasty food! It is a wonderful addition to any kitchen. Feel free to browse around, and use the labels to search for the different types of food cooked. I woke up to uncertain skies. There were intermittent clouds with more on the horizon. I'd planned to make meatloaf, but was beginning to have second thoughts. 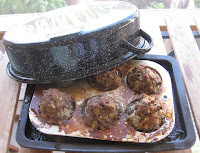 I decided to go with meatloaf muffins because they would cook faster. I improvised a lid by using a roasting pan, and luckily, just before putting them in the Sun Oven, I decided to set the muffin pan on a tray to catch any cooking juices. The muffins came out great. We had them with spaghetti and tomato sauce and the last minute decision to place them on a tray saved me from having to clean the Sun Oven.